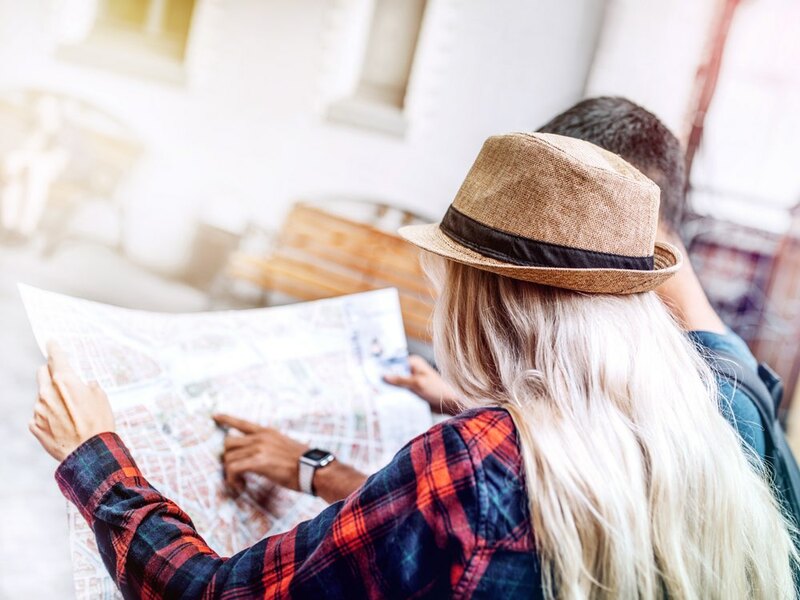 Maps & Guides that accompany tourists throughout their entire holiday! As experts, we help you reach target groups such as package holiday, independent, cultural, active, family and golf tourism. 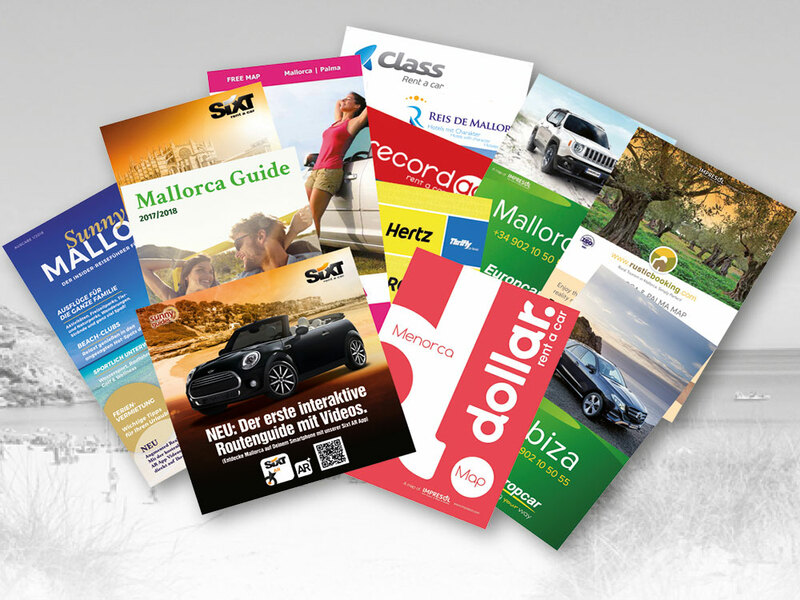 Maps & tourist guides, distribution of brochures or flyers, Mallorca blog, travel guides & magazines; our advertising media are renowned for their effectiveness and boast an outstanding reputation. Contact us, our team will assess you via e-mail, telephone or in person with the greatest of pleasure. Our advertising media take you directly to these future clients. Your publicity will be seen by 5 million tourists every year. And now in multimedia format: with the new Primeview app – videos, slide-shows, 3D animations & audio-guides. The reception staff of over 800 hotels, 60 car-hire company offices and, of course, their clients place their trust in Impresol advertising media. Would you like to capture this market? Leave it to the market leaders here in the Balearic Islands. Our extensive commercial network, our constant presence in hotel chains & associations and car-hire companies and our endeavour to keep abreast of the latest market trends converts us into your finest ally when aiming to capture both existing and emerging markets. Our maps & guides - always up-to-date! Revised once or twice a year. A copy of the map is given either with each car-hire contract or is placed directly in the car. A tag is hung from each rear view mirror. The sole ad spaces available on the tag & car-hire contract folders may be reserved separately from the map. Independent tourism of a medium-high purchasing power wishing to discover the island by car. Couples, families, singles, business people. A copy of the Ibiza map including street maps of various holiday regions is given with each car-hire contract, when clients collect their keys. Sun & Sand tourism staying at 3, 4 & 5 star hotels. A copy is included in each “welcome pack”, handed to clients at the airport on arrival. 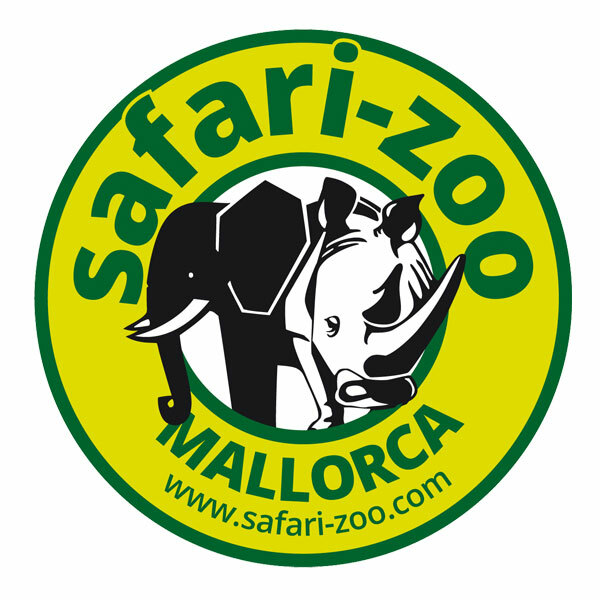 60.000 car-hire contracts per year in Mallorca – mobile, quality tourism. 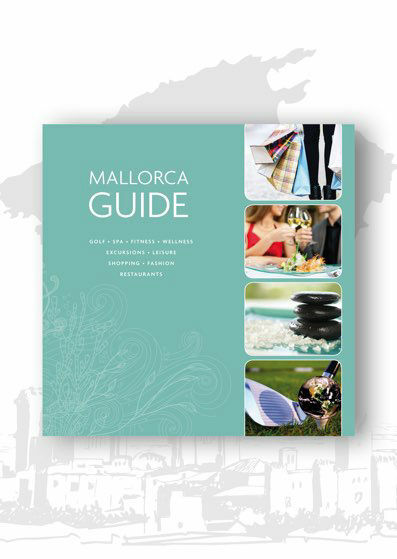 Exclusive tourist guides containing a series of recommended routes around Mallorca. 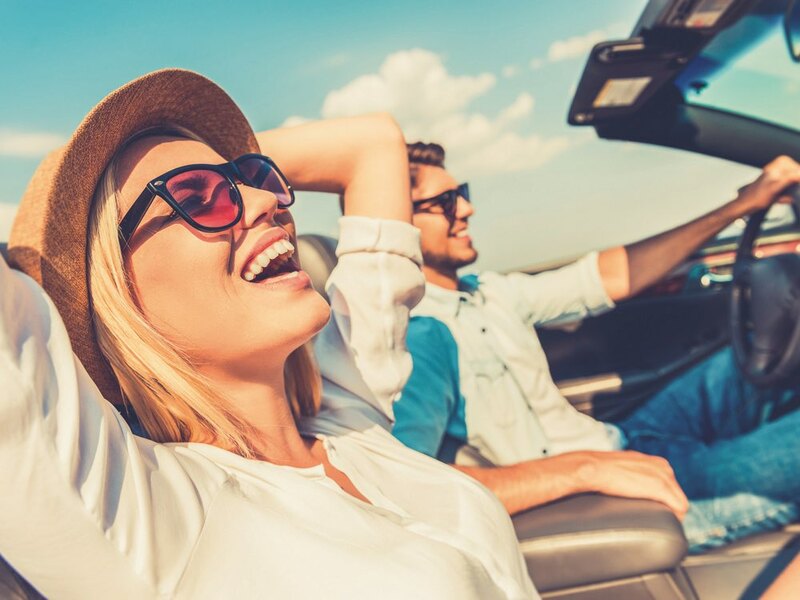 The ideal travel companion for those hiring a car; the perfect advertising media with ads containing a descriptive text and photos aimed at select businesses & companies. SunnyGuides target a sophisticated public with a high purchasing power. 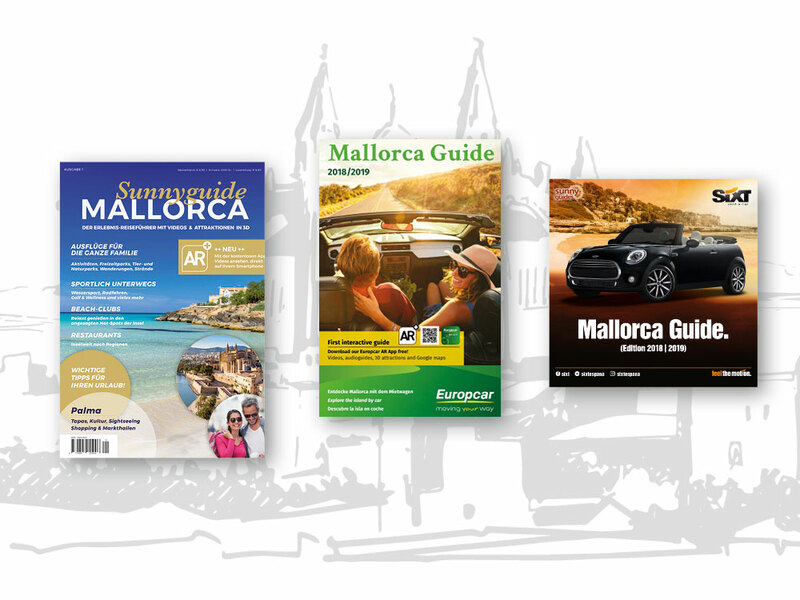 SunnyGuide Mallorca, a digital travel guide edited in German, is the ideal advertising media for that PR article or ad aimed at capturing the independent tourism market. The guide is distributed free of charge in holiday homes, in rural & urban hotels and through car rental companies around the island. Travel guide + epaper for clients staying in holiday homes, self-catering and hotels. Multimedia, interactive format incorporating the Primeview App. Bring your publicity to life! 2018 finally witnessed the fusion of the printed & digital world, the result being the introduction of a new technology in our advertising media: Augmented Reality. AR+ technology has been incorporated in many of our maps & guides; a revolutionary technology that functions thanks to the App “Primeview”, which converts ads into an animated and attractive new experience for readers. Your business is promoted in a short video or slide-show, your location point is indicated in Google maps together with the most direct route and a direct link to your website. The Impresol Primeview App combines printed media with the digital world. The printed contents (images, monuments and attractions) and ads conceal a series of digital interactions such as audio-guides, videos, slide-shows, links to web or social media sites and also to Google maps. How does the Primeview App work? Users of the maps and guides can download the app free of charge in the App Store and Google Play. Once they have selected their language (Spanish, German, English), the App is ready to use. When users focus the ad with the camera of their smartphone, it triggers a digital interaction which has previously been integrated into the ad. So what are the advantages for advertisers? re-directs users, or in other words new clients, to your website or social media page, hence increasing the number of visits to your site. 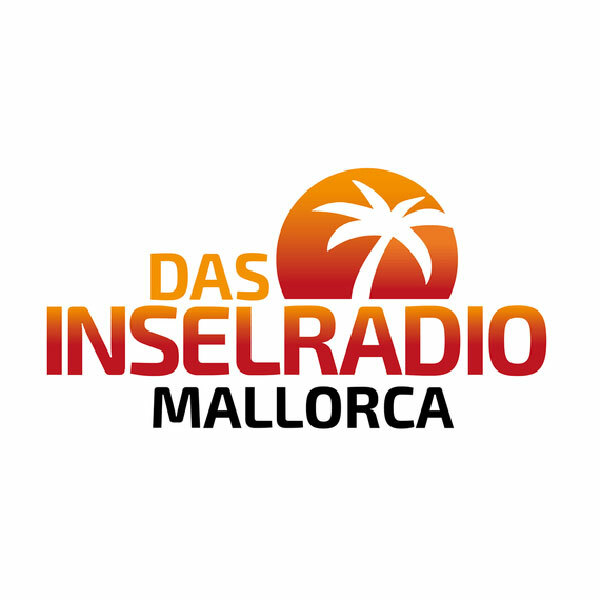 The German blog "www.mallorca-sunnyguide.com" is the ideal platform to promote your products and services. 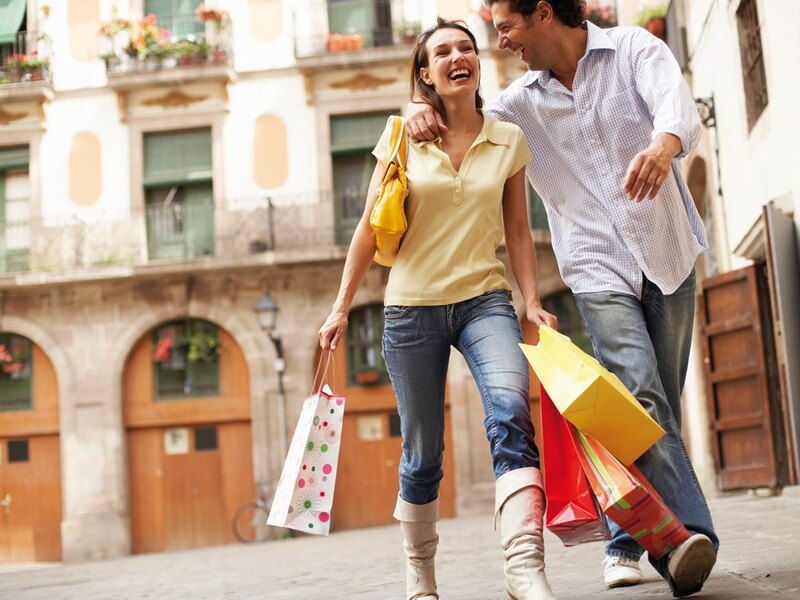 Here you’ll find the latest news and tendencies in Mallorca and ideas on what to do during your stay on the island: recommendations on restaurants and cuisine, car routes, the best places to go shopping and much more. Our copywriters will highlight the finest aspects of your business and inform readers as to any upcoming events, offers and any other news on your products and services. As experts and in addition to our own range of products, we also offer a cross-media assessment service, or to be more specific, a portfolio of alternative advertising media that complements our range to perfection; printed media, radio, promotions, point-of-sale marketing campaigns, digital media and PR initiatives. We have extensive knowledge of the market and its various target groups and the local advertising media available. We’ll create your campaign at a competitive price and supervise the development and execution of the entire process in situ. Interested? Have you ever thought of promoting your product or business via more exclusive channels? Why not distribute your publicity and samples in hired cars, hotels, Agro-tourism and rural hotels, holiday homes or on luxury yachts? Call or send us an e-mail – we’ll assess you with the greatest of pleasure! Ads with additional rent a car companies such as Hiper rent a car, Vanrell, Centauro, AEVAB, Record Go, Goldcar, etc. Sixt rent a car, Europcar, Hertz, Dollar, Click rent, Class rent a car, Thomas Cook Group, Marriott Vacation Club, FEHM Federación Empresarial Hotelera de Mallorca, Asociación Hotelera de Palma de Mallorca, Associació Balear d’Agroturismes i Turisme d’Interior, holiday home agencies and many more. The Balearic Islands are the most popular destination among German and British tourists. More than 5 million German and 4 million British tourists visit the island every year. 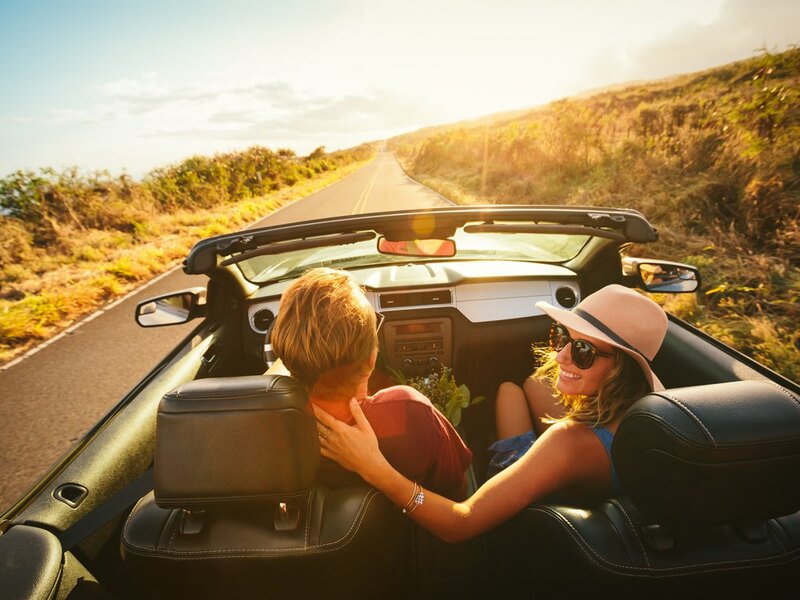 Sunnymaps will lead you straight to this target group, comprised of families and couples staying in 3 – 5-star hotels. Independent tourism in Mallorca is on the rise! The number of tourists who in search of quality and freedom, reserve their accommodation, flight and car online in order to be able to discover the island at their ease, is on the increase. 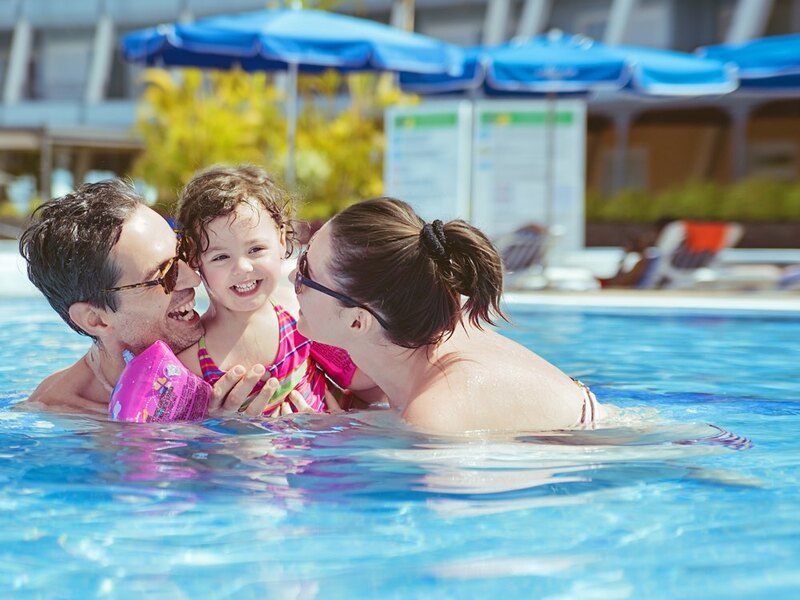 Family tourism is one of the most important markets in the Balearic Islands; endless, sandy beaches, the extensive leisure offer available and the range of hotels destined exclusively to families convert the Balearic Islands into the ideal holiday destination. The high season is from May to October. Mallorca is a paradise for golfers; proof of which are the 150.000 golf enthusiasts that visit the island every year. 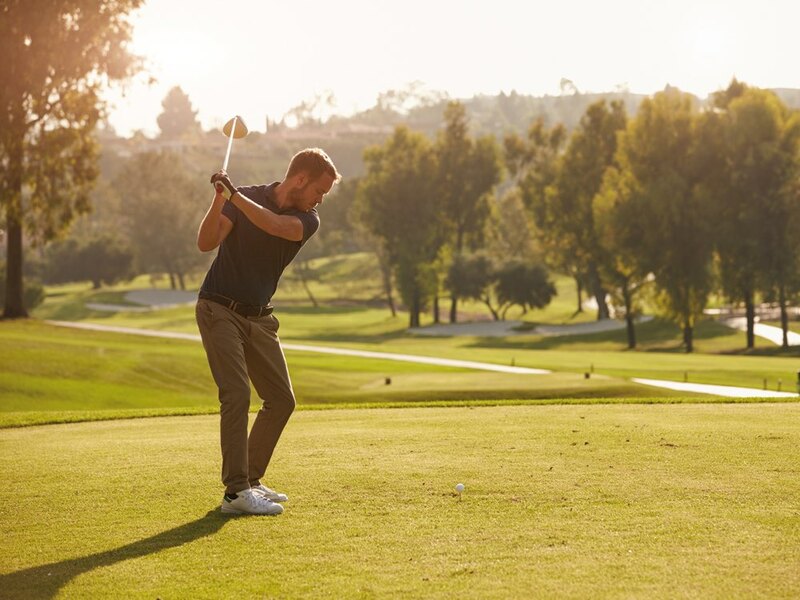 Its moderate climate and a total of 24 superb golf courses ensure the perfect game whatever the time of year. Mallorca is destination par excellence for many cyclists and cycle-tourism clubs, not to mention professional and amateur teams. Approximately 120.000 cycle-tourists visit Mallorca every year. The classic season runs from February to May & from September to November. Palma is one of the most beautiful cities of the Mediterranean. Its old quarters, boutique hotels, markets, restaurants and “tapas” bars, not to mention its varied range of shops and businesses attract millions of tourists of many nationalities. Tourists receive their resort map on the first day of their holiday. 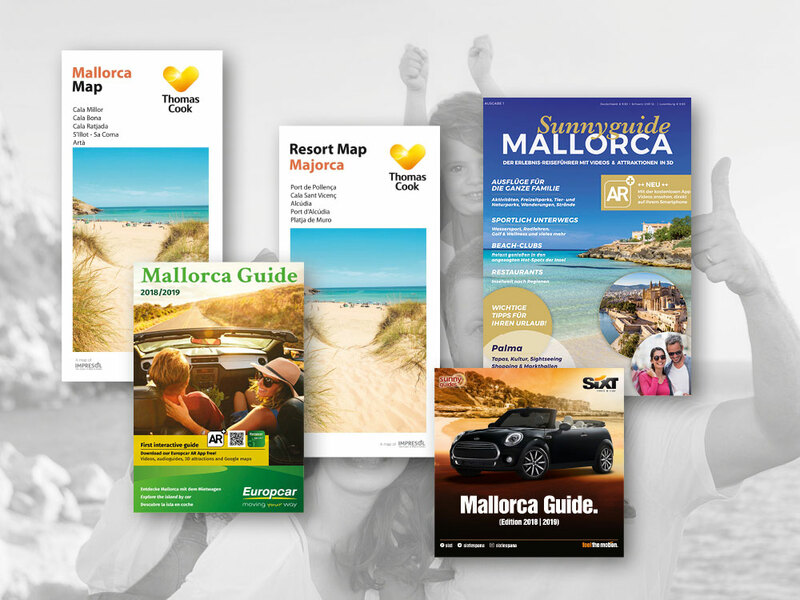 The Thomas Cook and Neckermann travel representatives distribute the maps to each client in person, inviting them to make the most of the offers and services they promote. Could there be a more direct method? Impresol is the oficial supplier of the Federación Empresarial de Hoteles de Mallorca (FEHM). 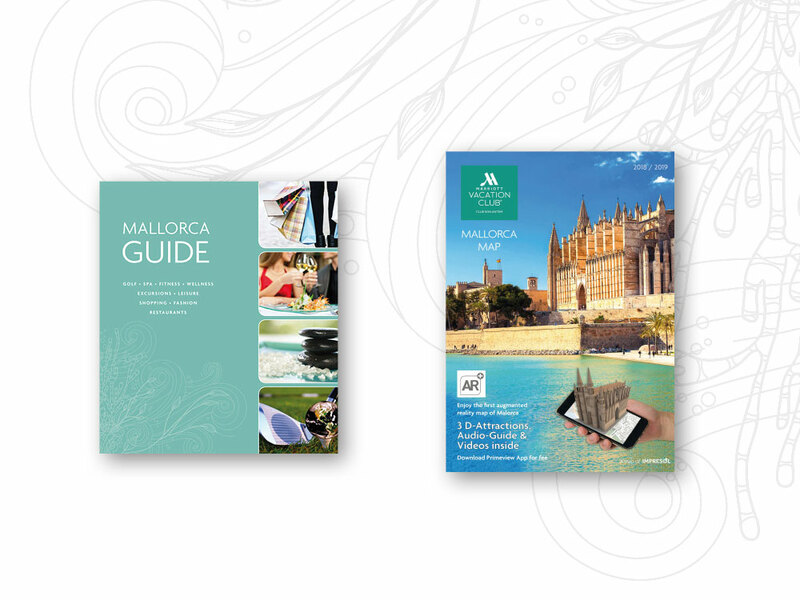 The maps are distributed on behalf of the Federation and are available at the reception desk of all member hotels on the island of Mallorca. This target group chooses to discover the island at their ease. "Independence and quality" is its motto. 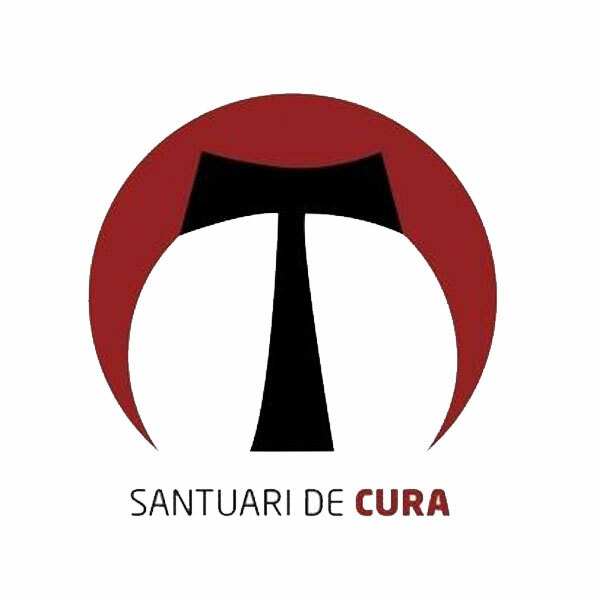 Capture this target group in Mallorca, Ibiza and Menorca with the aid of our partners; Associació Balear d’Agroturismes i Turisme d’Interior, Sixt, Europcar, Click rent, Class rent, Record Go, Hertz, Dollar, SunnyGuide! 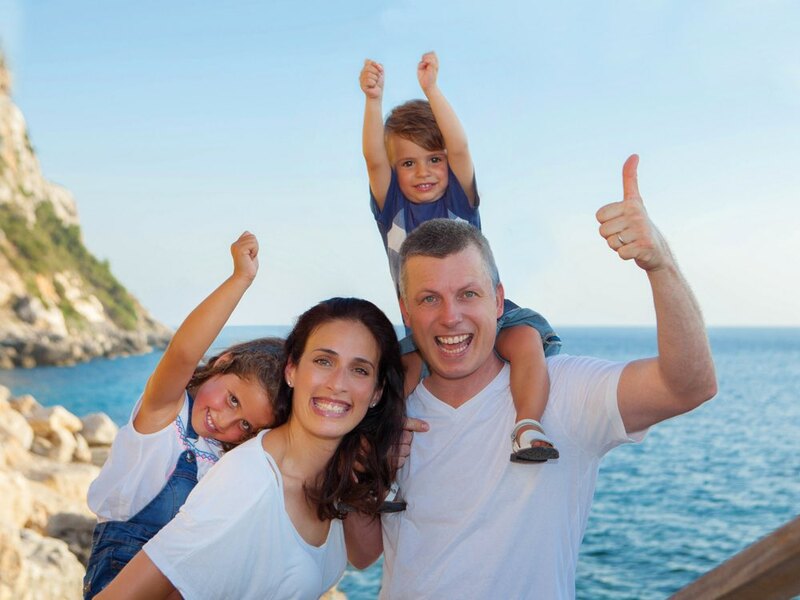 Family tourism is one of the most important markets in the Balearic Islands! Endless, sandy beaches, the extensive leisure offer available and the range of hotels destined exclusively to families convert the Balearic Islands into the ideal holiday destination. The high season is from May to October. Mallorca is a paradise for golfers! With a total of 24 golf courses and the island’s mild climate, fun is guaranteed all year round. Some 150.000 players choose the island every year to practice their favourite sport. Capture this high-spending target group with premium rent a cars companies or hotel associations. 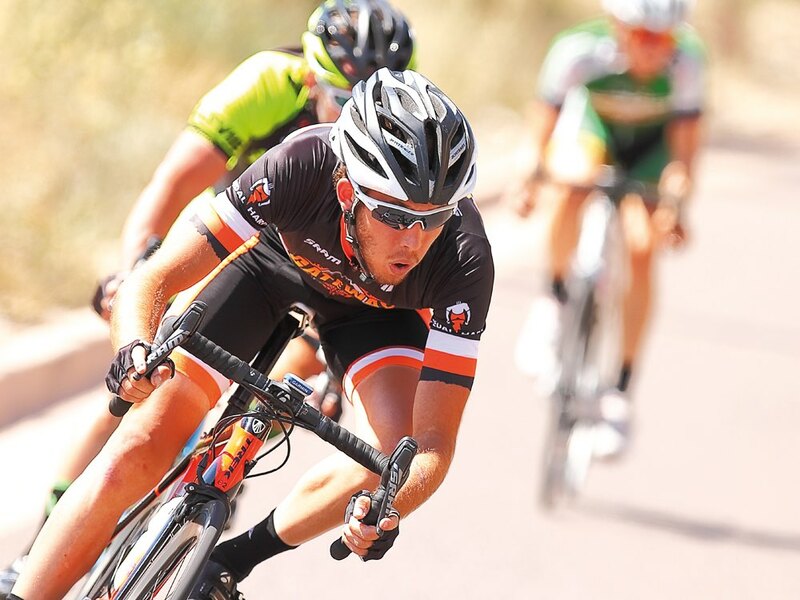 Mallorca is destination par excellence for many cyclists and cycle-tourism clubs, not to mention professional and amateur teams! Approximately 120.000 cycle-tourists visit Mallorca every year. The classic season runs from February to May and from September to November. 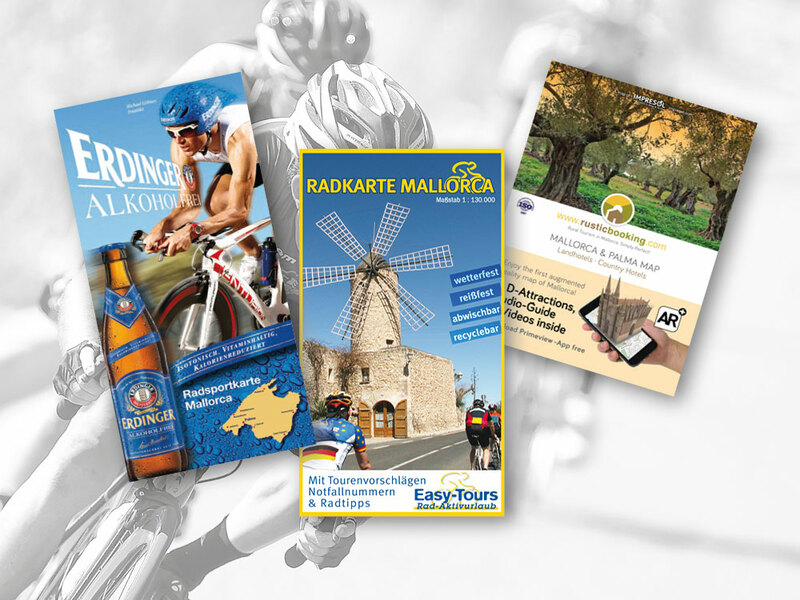 Cycling tour operators demand a highly detailed map made from a specific, waterproof material. As experts in the sector, we design and produce these maps as per your specifications. 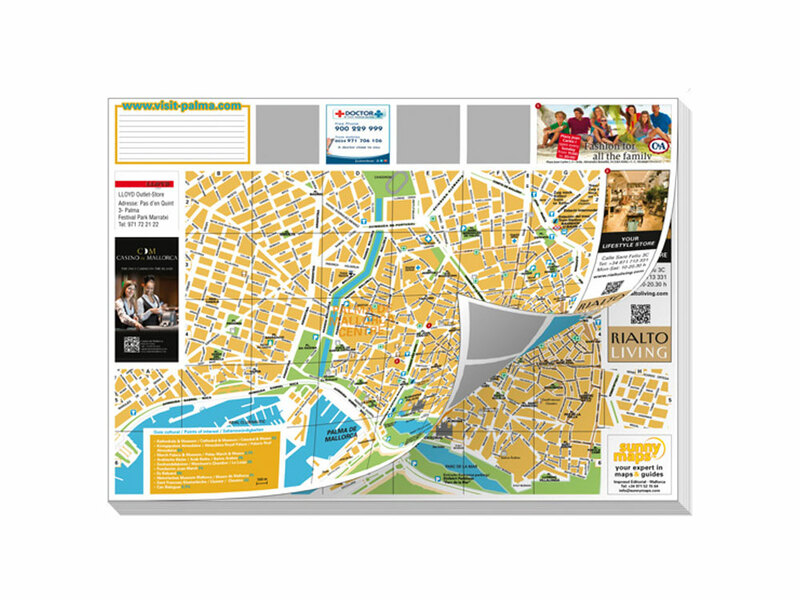 The HotelMap, in block format with 100 maps per block, is the leader in the street map market of. Its excellent distribution network and the number of hotels to which it is delivered, means that your advertising reaches the great majority of tourists and business people visiting the city every year. You’ll hardly ever see another map, other than the HotelMap, in the hands of tourists exploring Palma. Why? Our advertisers include some of the leading businesses on the island. Its practical design is geared towards clients’ needs and is a boon in aiding receptionists to give specific information and indications. This is why it is so popular. Direct contact with the hotels – The maps are delivered to the hotels by the IMPRESOL delivery service. The Hotel Association places delivery orders 4 – 5 times a year, following which the maps are sent straight to the hotel. Complementary distribution – the HotelMap is not only available to tourists staying in the hotels, but also at restaurants, cultural institutions and at the businesses of our advertisers in Palma. 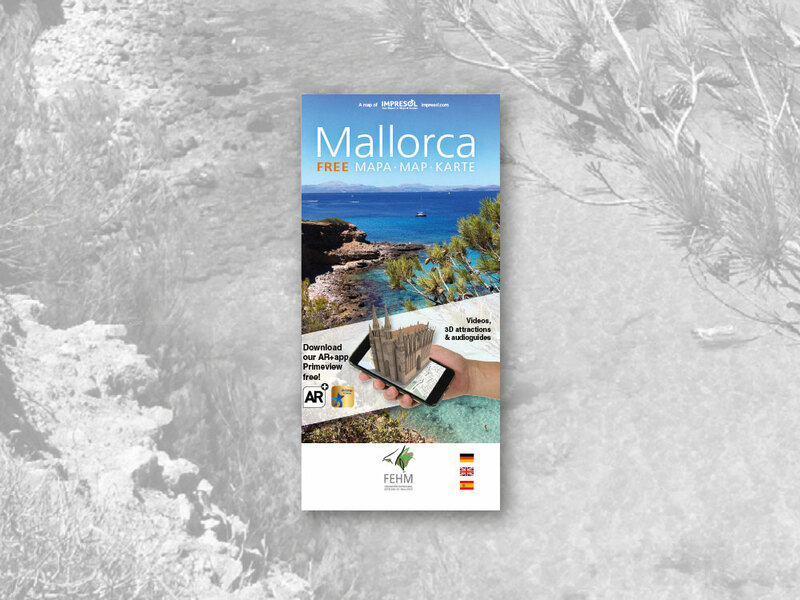 Since 1997 our editorial has focused on the production and distribution of maps, street plans and guides aimed at tourists in the Balearic Islands. Our strong points? Our marked and increasing presence on a regional level, our know-how of the local market and the contacts we have forged over the years. Our international team will assess you in various languages. What are you waiting for? 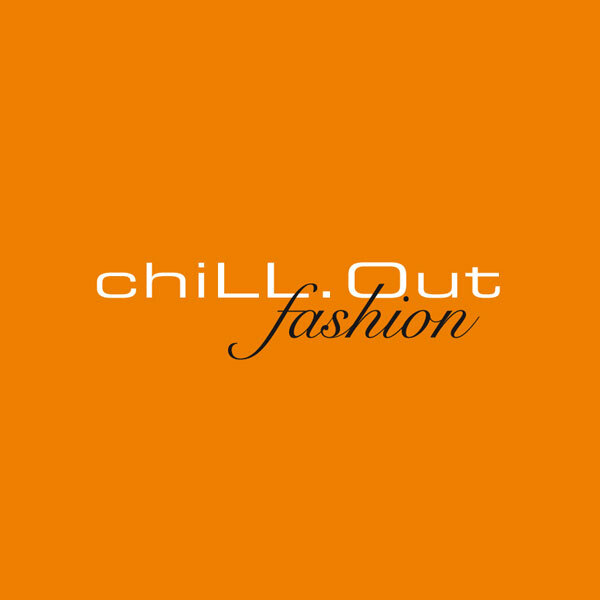 Make the most our extensive network and experience to promote your services or products. 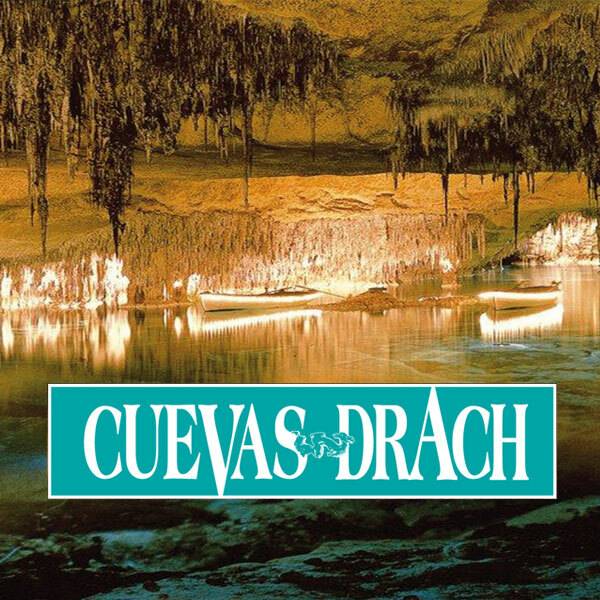 To be honest, the number of car-hire tourists visiting the caves is increasing every year. The publicity is obviously working very well. We’ve been advertising with Impresol for the past 10 years and we are more than happy with their professionalism, trustworthiness and the 100% efficiency of the distribution of the maps & guides. A huge success – the contents of the magazine cover every subject you could imagine. 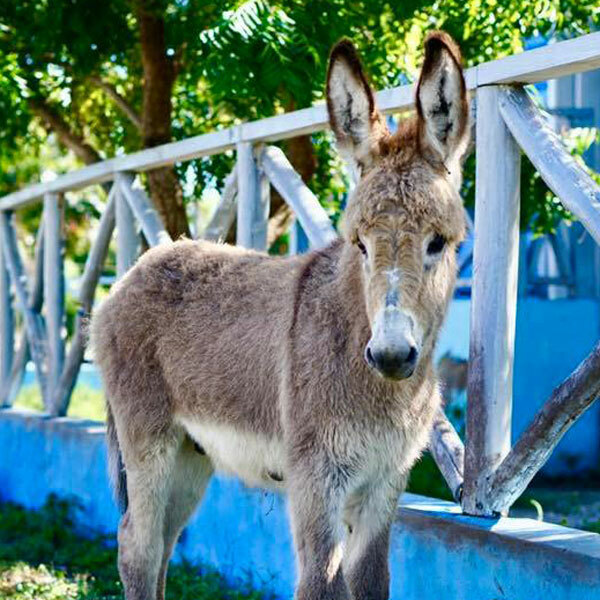 SunnyGuide has all the info you could possibly need whilst on the island. I rent out a holiday home and leave the magazine at the disposal of my clients, that way I don’t have to explain anything at all Congratulations to all the team! Hi ladies, here is my own, personal recommendation. I love the travel magazine. The Augmented Reality app gives it a whole new twist and makes it fun. It’s a great idea! The Mayers send a huge “We Like”. Hey everyone buy it! Don’t miss this magazine, you won’t regret it. A must for enthusiasts of Mallorca. In addition, it’s really practical says Mrs. Mayer. 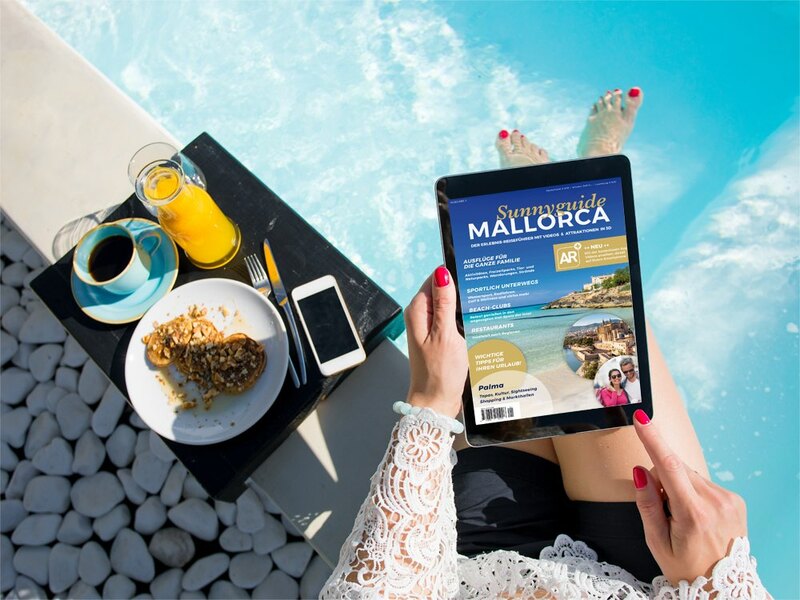 The SunnyGuide Mallorca magazine is out of this world! I’m impressed! The quality of the final product is excellent. 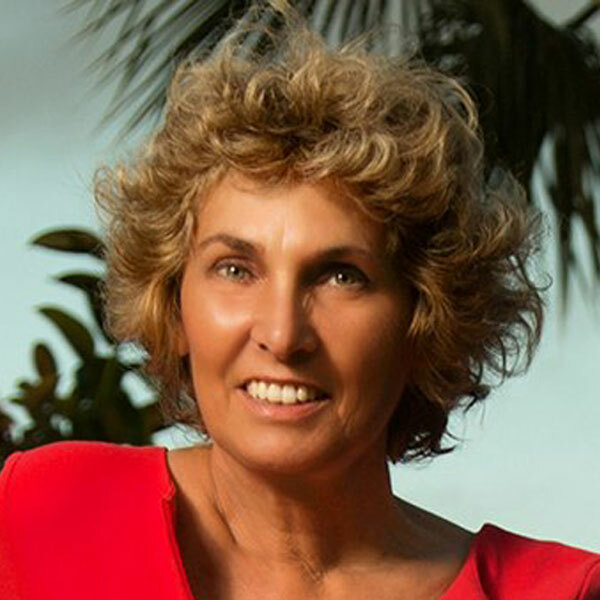 The guides reach their target group and capture a greater number of potential clients. I know that my publicity reaches the client and that they appreciate it for its quality. I certainly get my money’s worth. Impresol maps and guides, including several interesting routes around the island, affords that extra, added value to clients. Another advantage being the excellent, no loss implied, distribution of the final product via rent a car companies. 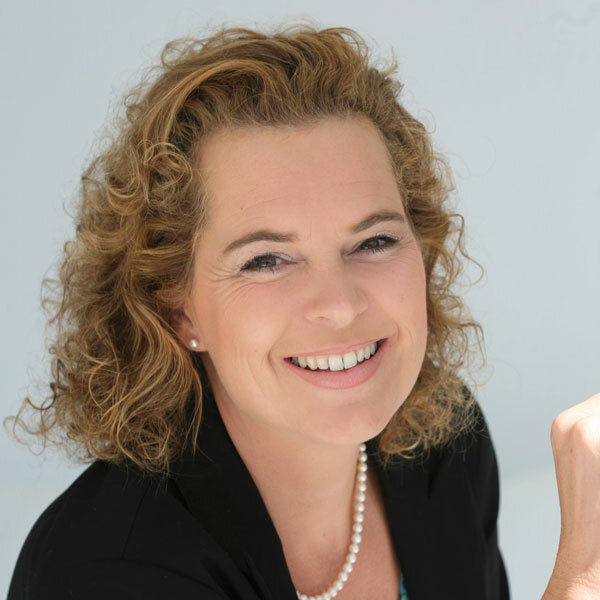 As Managing Director and Legal Representative, Maren Amberg is responsable for the management of this website. Despite careful control, Impresol Publicidad, S.L. assumes no liability for the content of external links as the operators of the linked pages are solely responsible for their content. The reproduction or copying (including printing), either partial or complete, of the material featured on this website is forbidden except for advertising purposes related to SUNNYMAPS or Impresol Publicidad S.L., in which case it will only be allowed with express written prior consent. The use, reproduction, redistribution, modification or publication of the contents of this website for any other purpose other than the aforementioned is forbidden, failing express written prior consent from Impresol Publicidad S.L. In general, users may access our website without having to give any personal details. Personal data collection, such as name, address or e-mail addresses, etc., is performed, where possible, in a voluntary manner. None of the data collected is sold, let or passed on to third parties, failing when the data provider expressly authorises to the contrary. In compliance with the provisions of current laws on the Personal Data Protection, we inform you that your information will be added to the processing system belonging to IMPRESOL PUBLICIDAD, S.L., whose tax identification number is B07908924 and registered address is APARTADO DE CORREOS, 2 07430 LLUBÍ (BALEARIC ISLANDS), for the purpose of responding to your queries and sending you information that you may be interested in. In compliance with current Law, IMPRESOL PUBLICIDAD, S.L. informs that personal information will be stored only for as long as strictly necessary to comply with the aforementioned provisions. Unless stated elsewise, we assume that your information has not changed, that you commit to inform us of any changes and that we have your consent to use said information for the aforementioned purposes. IMPRESOL PUBLICIDAD, S.L. informs that it will process said information in a legal, loyal, transparent, appropriate, pertinent, limited, accurate and updated manner. For this reason, IMPRESOL PUBLICIDAD, S.L. commits to taking all reasonable measures to delete or rectify them should they be inaccurate. In accordance with the rights afforded by current data protection laws, users shall have the right to access, rectify, limit the processing of, delete, transfer or oppose the processing of their personal information, as well as to revoke the consent provided for its processing. You can do so by addressing your request to the address detailed above or by email, to direccion@impresol.com. We also inform you that you can contact the Delegate for Data Protection of IMPRESOL PUBLICIDAD, S.L. by writing to dpo.cliente@conversia.es or calling 902877192. You may contact the pertinent Regulatory Authority and submit any complaints you deem appropriate.